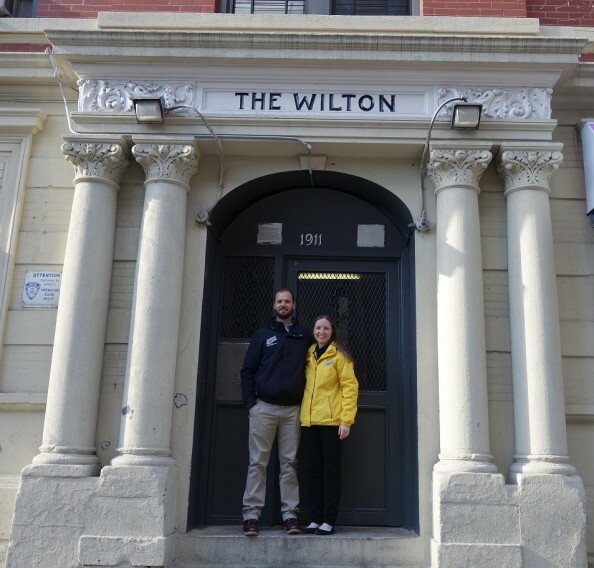 UNHP Field Manager, Brendan Mitchell and Deputy Director, Johanna C. Kletter stand proudly in front of The Wilton HDFC, two buildings with a total of 32 units. Johanna packaged the refinancing loan with NYC HDC and HPD and together, Johanna and Brendan oversaw the improvements to the buildings. Along with a new name, The Wilton, etched above their front door, the 32 families who reside in the buildings at Anthony and Tremont Avenues have also received new windows and public improvements in time for the holidays. The Wilton HDFC, formerly known as Tremont Avenue Apartments LP, has been christened with a new name to reflect its historical past and its new financial structure which ensures its continued affordability. 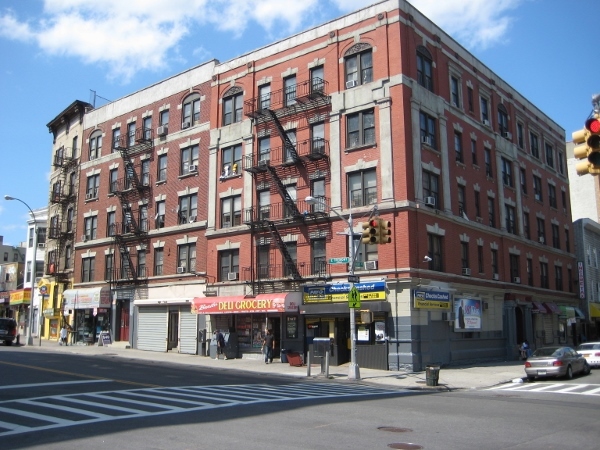 The buildings were refinanced and renovated 15 years ago with funds made available through the Low Income Housing Tax Credit (LIHTC) syndicated by Enterprise Community Partners. With the expiration of the LIHTC, UNHP sought to refinance the buildings and move it into a new affordable financing structure. Working with the NYC Housing Development Corporation (HDC) and NYC HPD, the building obtained new financing and a 420-c NYC tax abatement. The closing was held in June of 2016 and The Wilton received its new (old) name as well as improvements welcomed by tenants. New windows and improvements to the common area included brighter more energy efficient LED motion sensor lighting, new hall floors, painted hallways and new mailboxes with lockers for secure package delivery. Four vacant units received new kitchens, bathrooms and floors and UNHP plans to upgrade the remaining units as they become vacant. New windows, hallway flooring, exterior work, public lighting, painting and secure mailboxes are among the work that was completed since the refinancing in June 2016. Vacant units received new kitchens and bathrooms and going forward all vacant units will be upgraded. UNHP has a long history with the buildings dating back to the early 1990’s. The Wilton was one of the many buildings that were over-financed and later foreclosed on by Freddie Mac. The Northwest Bronx Community and Clergy Coalition (NWBCCC) organized the tenants in the buildings as part of a campaign to gain improvements in Freddie Mac mortgaged properties. After efforts to gain improvements in their severely deteriorated buildings failed, the tenants worked with UNHP to move forward with a community ownership option. UNHP worked with Chase and HPD to obtain a Participation (PLP) loan to fund the acquisition, which was later repaid through the Low Income Housing Tax Credit (LIHTC) packaged by Enterprise Community Partners. UNHP and the building manager, Dougert Management made significant improvements to the building after its purchase and upon receiving the LIHTC. Dougert Management’s skills, the cooperation of tenants and ten vacant units enabled the checker-boarding of tenants to remove the lead hazards by laminating the walls. Basic heat and hot water services were returned to the tenants with a new boiler and hot water system. Structural defects were corrected with extensive beam work and a new roof. The financial restructuring via the LIHTC, the improvements to the property and the ongoing commitment to improve the property and maintain its affordability left these buildings in good stead for the 15 years of the tax credit. 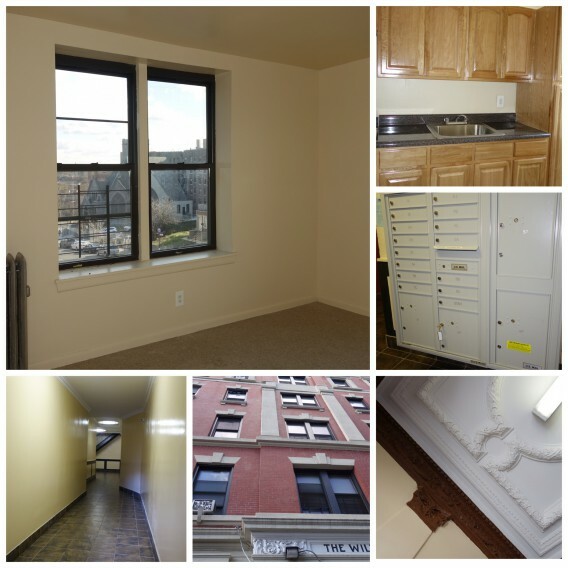 The 2016 HDC refinance and NYC tax abatement brought additional building improvements and a stabilized financing structure that will ensure the long term affordability of the project. Two buildings with one boiler, The Wilton sits on the corner of Tremont and Anthony Avenues. It has 32 units, mostly 3 and 4 bedrooms, as well as commercial space on the ground floor. Working over twenty years, UNHP, along with the tenants, has moved these buildings from two over-financed, foreclosed, severely deteriorated rental buildings to 32 units of decent affordable housing for low-income individuals and families. The building has many larger units (3 and 4 bedrooms) to accommodate larger families as well as commercial tenants. Some of the original tenants who lived there during the foreclosure still remain. UNHP worked with 6 other Freddie Mac foreclosed properties in the 1990’s to transfer them to community ownership and restore decent living conditions for the tenants who lived there. To learn more about the organizing effort around over-financed Freddie Mac mortgages read this article by Professor Margaret Groarke PhD. The U.S. Government Accountability Office issued a report on the abuses in 1991. UNHP received numerous awards commending our work and the work of our partners to preserve the Freddie Mac foreclosed Bronx properties as affordable, decent multifamily rental housing. Special thanks to Kevin Alter, Eric Vazquez and Jose Maldonado from Dougert Management for their work on this and other buildings in the Bronx to keep them well maintained. UNHP would also like to thank the following for their work on the repairs and refinancing of these buildings.